These smart devices work by moving the patient’s lower jaw forward slightly, which tightens the soft tissue and muscles of the upper airway to prevent the obstruction of the airway during sleep. Sleep Apnea is a condition that can make you tired, no matter how much sleep you get. Symptoms include loud snoring and chronic sleepiness. Children may have Sleep Apnea if they breathe through their mouths rather than their noses during the day. The condition is caused by a narrowing of the airways while you sleep. Sleep Apnea can be treated with a continuous positive airway pressure (CPAP) mask, but many people find them uncomfortable. Another simpler approach can be prescribed and fabricated by Dr. Pasternack. It’s called a mandibular advancement device. 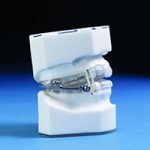 These smart devices work by moving the patient’s lower jaw forward slightly, which tightens the soft tissue and muscles of the upper airway to prevent the obstruction of the airway during sleep. The tightening created by the device also prevents the tissues of the upper airway from vibrating as air passes over them–the most common cause of loud snoring. Untreated Sleep Apnea is a serious medical condition which increases your risk of cardiovascular problems, high blood pressure, obesity, diabetes and work- or driving-related accidents. In children, it can cause hyperactivity and poor school performance. If you suspect you may have Sleep Apnea, you can be diagnosed with a questionnaire and a sleep study. To find out more, contact us at Granite Dental Group today. We’ll help you get the good night’s sleep you deserve.